REI’s #OptOutside campaign is still consumerist. It’s a marketing campaign to get you to buy more outdoors gear later. 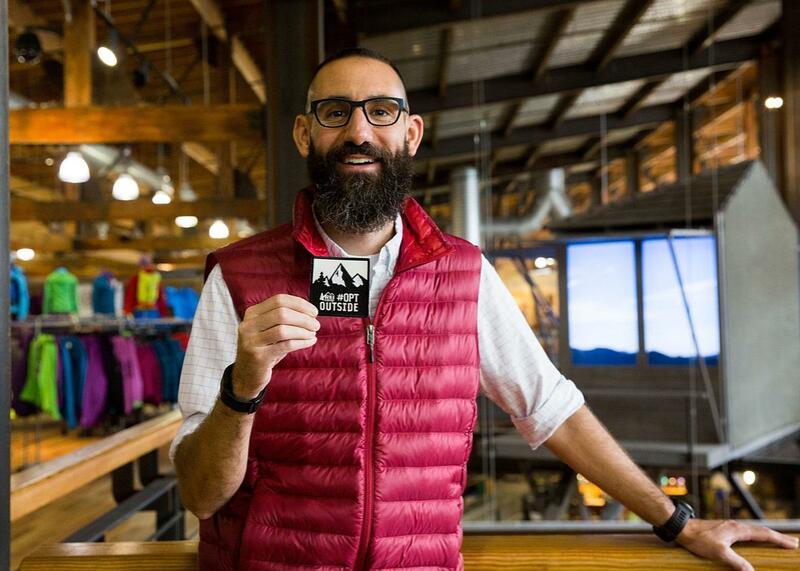 Ben Steele of REI announces Black Friday closures at its stores nationwide with an unveiling at the Seattle flagship store for the #OptOutside initiative on Oct. 27, 2015. This story was originally published on the Conversation and was republished here with permission. While shoppers scramble for Black Friday bargains this year, outdoor retailer REI is closing its 154 U.S. stores. This is the third consecutive year that the Seattle-based company will ignore the frenzy that traditionally marks the start of the holiday shopping season. REI’s nearly 12,000 employees will get a paid holiday and will not process any online orders. Instead, REI exhorts workers and customers to get outside with family and friends. #OptOutside, a Twitter hashtag that REI coined to promote its anti–Black Friday, has been widely adopted by outdoor lovers, as well as environmental groups and businesses that partner with REI to promote this event. The campaign has drawn international praise from the advertising industry and has become a yearly phenomenon. State parks from Oregon to Indiana, often in concert with local nonprofits, offer free admission and other perks on Black Friday. This year REI is launching an “experiential search engine” where users can share photos and video of their favorite outdoor destinations, augmented with information, such as directions to trailheads or events celebrating our nation’s public lands. Many observers have praised REI for mixing business savvy with crunchy acumen. But how did REI and other outdoor companies align themselves with conservation? How do they square selling expensive apparel and promoting carbon-spewing tourism with their customers’ love for the outdoors? And how radical is “Green Friday,” especially if the Opt Outsiders are carrying backpacks stuffed with the latest gear made from precious petroleum, rare metals, and pricey fibers? The paradoxes of modern outdoor retailing have deep roots in the American conservation movement. Nineteenth-century trailblazers such as John Muir grew alarmed as they saw wildlife decimated, forests denuded, and scenery despoiled. Among the loudest protesters were affluent outdoorsmen, such as Theodore Roosevelt, founder of the Boone and Crockett Club, and William Temple Hornaday, first director of the New York Zoological Society. By calling to protect nature, these conservationists also protected their own hunting and fishing entitlements. They attacked the rural poor, immigrants, and minorities, who Hornaday once called the “regular army of destruction” because they took fish and game for subsistence or sale. They used their money and power to license hunters and anglers, limit harvests and ban equipment. Some of these measures protected nature (and still do), but they also intentionally reserved nature for those who could consume it properly by the standards of wealthy conservationists. Others chafed against even these austere types of play, seeing outdoor recreation as a costly privilege. They mobilized leisure as political protest. Seattle’s Co-Operative Campers, launched in 1916 as a cheaper alternative to the Mountaineers, pledged to “make our mountains accessible through co-operative camps” for the city’s blue-collar citizens. Socialist activist Anna Louise Strong was the Co-Op Campers’ first president. She and the Co-Op Campers often clashed with the Mountaineers over politics and camping techniques until the club disbanded during the 1920s Red Scare. REI took root in this contested consumerist soil. Lloyd Anderson, an REI founder, conspired with other members of the Mountaineers to promote riskier activities, such as rock climbing. He quickly learned that they did not have the requisite gear. Influenced by other local co-ops, Anderson organized REI in 1938 to pool members’ annual fees so the group could purchase quality equipment from Europe at affordable prices. As costs for lightweight materials such as aluminum and nylon fell after World War II, REI attracted a burgeoning following locally and nationally. And it continued to trade on its founders’ cooperative and environmental vision. In 1976, a year after opening its first retail store outside of Seattle, it launched an environmental grants initiative, and in 1989 the firm co-founded the Conservation Alliance, a group of outdoor businesses dedicated to environmental protection. Yet REI’s #OptOutside campaign can seem superficial compared with more radical stances. Patagonia, founded in 1973 by Yvon Chouinard as a spinoff from his self-named climbing equipment company, has promoted recyclable clothing and applied tough sustainability standards to its global supply chains. In its 2013 “Don’t Buy This Jacket” campaign, Patagonia even encouraged customers to make do with less. In this context, REI’s Black Friday campaign can look like an unabashed marketing ploy that ignores the fundamental source of our environmental problems: humans’ overuse of the Earth’s resources. But is this a bad thing to admit? Perhaps. To deny the inherent contradictions of Green Friday is to ignore how affection for nature collides with our longing to consume it. By asking customers to think about what they are buying, Patagonia tries to foreground the environmental and social ethics of buying a new fleece jacket. REI, by contrast, asks us to take a one-day shopping holiday to help the planet. At best it is a lighter-green vision. REI and its competitors are businesses, and none of these efforts supersede retailers’ bottom lines. Greenwashing is just the latest term for an old phenomenon: tethering consumption to environmental values. And consumers have proclaimed their environmental values through purchasing power since the dawn of the conservation movement. Ultimately, there is no such thing as truly green consumption. Consider Cyber Monday, just after Thanksgiving, when retailers seek to entice consumers to spend online with early holiday discounts. Is internet shopping better for the environment than driving to the mall? It may keep us off the road, but online shopping does not eliminate environmental costs—it just diverts them to the data warehouses that power retailers’ mail-order divisions and to the planes and trucks that deliver the goods to consumers. Moreover, is hitting the trail really escaping “the Internet of Things” when hikers can share their every move and thought by mobile phone or other wireless devices? This Thanksgiving, take time to remember the late biologist Barry Commoner’s famous aphorism: There’s no such thing as a free lunch. Editor’s note: This is an updated version of an article originally published on Nov. 18, 2016.